“What is important in what we must call a work by Duchamp is not exactly what one has before one’s eyes but the stimulus that this sign provokes in the mind of the onlooker. The worth of a work of art does not come so much from what its creator condensed in it through his talent and experience as from the unexpected resonances and harmonics that it sets loose in the reader or viewer” (Levesque 11). Resonances. Harmonics. If those terms recall the art of sound more than figures in the round, the sidestep is deliberate. “All art,” Walter Pater reminds us, “aspires to the condition of music” (14). And the dynamics of music, to extend the assertion, provide a clue to the mechanic by which the artist in any medium utilizes idiosyncratic materials to create illuminated meaning of a high order. For if we confess that to aspire to the condition of a medium is to honor its principles, we must attend to music’s most salient law: the marriage of form and matter, the material of construction and aesthetic meaning. Here is a union indissoluble save by the destruction of its components: Remove the pattern of notes from a Bach fugue and the work’s sounded illuminations vanish. This mechanic holds as well with the sister arts. Creative individuals in any medium who successfully undertake a formal fusion must consider the substance at hand less as conduit of meaning and more as material of construction. Because the latter possesses an ostensible meaning which resists fusion with form, the artist must engage in a productive transformation of each medium’s superficial elements: unadorned melody in music, natural image in sculpture, patterns of structure and utility in architecture. Accompanied by a requisite distortion of the underlying form, this dynamic results in elements, among them abstract chords in music and complex planes in the plastic arts, which challenge and enrich the talented viewer. Everything said above applies to the substantial word. 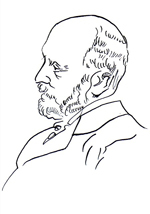 That the artist’s view of language differs essentially from that of the practical communicator was emphasized by a participant at a commemorative conference sponsored by The Henry James Society on the centenary of its titular author’s death: “Part of what we deal with is ambiguity in the concept of the medium. A medium is both an intervening substance which sets up a structure of communication and also something for making art, an expressive capacity” (Alworth). Because the novelist who views language in its expressive capacity subjects the common parlance to a pronounced level of abstraction, the distortion requisite to the condition of music is as evident in printed work as in other arts. Henry James visited his novels with a number of linguistic idiosyncrasies which became more prevalent as later years brought a sure command over the textual levers. In a celebrated essay titled “The First Paragraph of The Ambassadors,” Ian Watt identified these as “a preference for non-transitive verbs; many abstract nouns; much use of ‘that’; a certain amount of elegant variation to avoid piling up personal pronouns and adjectives such as ‘he’, ‘his’ and ‘him’; and the presence of a great many negatives and near-negatives.” Watt added that James favored “the delayed specification of referents” and that his verbs tended “to express states of being rather than particular finite actions affecting objects.” To this array we will add a notable preference for metaphors. All of these linguistic attributes result from the author’s shift of attention from activities of the natural world to those of the mind. For the reader, the challenge is not so much to understand the apparent meaning of the words and sentences—for to such a refined state has ostensible meaning been transformed—as to marshal the effort and insight requisite to the co-creation of that illuminated meaning, that condition of music, which for the work of highest value is paramount. Some such happily-provoked remarks as these, from Charlotte, at the other house, had been in the air, but we have seen how there was also in the air, for our young women, as an emanation from the same source, a distilled difference of which the very principle was to keep down objections and retorts. That impression came back—it had its hours of doing so; and it may interest us on the ground of its having prompted in Maggie a final reflection, a reflection out of the heart of which a light flashed for her like a great flower grown in a night. As soon as this light had spread a little it produced in some quarters a surprising distinctness, made her of a sudden ask herself why there should have been even for three days the least obscurity (328). Little wonder James is sometimes compared with the Impressionists—does not each phrase seem rather like a dash of brush on canvas? That the effort of abstraction, so apparent in isolated sections, extends into the novel entire accounts for that illuminated meaning which, when engineered by a talented reader, creates value at the highest level. Any attempt by James to bring about the same resonance with base propositions would of necessity fail; one can imagine the author, by his own standards being “one upon whom nothing is lost,” sensing the fatal disconnect between the subtle interplay of the characters and an easily accessible exposition of their most apparent activities. James assured the creation of illuminated meaning by repairing the disconnect with a formal construct of a nature that challenges and rewards the ambitious reader. Practitioners in all the arts recognize the same formal imperative as our novelist, even when the materials of construction seem free of the yoke of ostensible meaning. The stone of sculpture, which on the surface lacks a statement native to its substance, nevertheless is haunted by a historic fusion of material with the face of nature, with a concomitant natural representation as conventional as that of sign and word. It was this natural representation which caused Pater to denigrate sculpture’s “one-sided presentment of mere form. . .which tries vainly to compete with the reality of nature itself.” (Here the term “mere form” signifies a conscious imitation of nature’s surface rather than a set of substantial principles which are for the artist the levers of engagement). The Pater who challenges sculpture as too often a “thing of heavy shadows and an individuality of expression pushed to caricature” might just as well be talking about the popular novel with its coarse significations (37). A successful divorce of sculpture from its historic subjection to representation is apparent today. Sculptors have essentially recognized and engaged with the need to aspire to the condition of music, in the process producing what Pater championed as the “etherealizing, spiritualizing” dynamic of living art. As sculpture, so architecture where an unburdening of a historic fusion of conventional signs and the materials of craft has displaced structural and utilitarian projections with imaginative constructs. 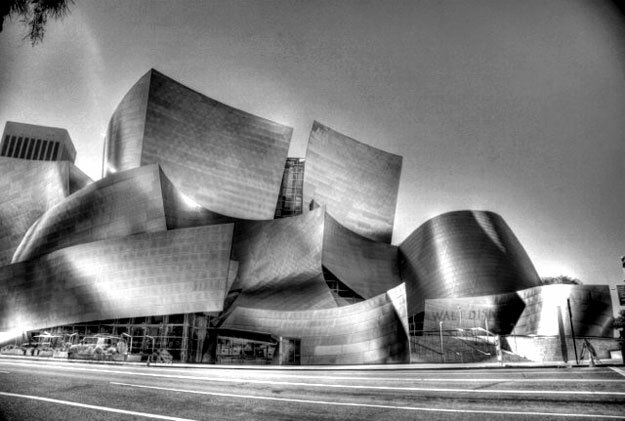 The residents of the city of Los Angeles may, hence, recognize the condition of music in Frank Gehry’s concert hall (pictured). The creation of value in all of the arts relies on the successful resolution of the conflict between the rules of art and the laws of composition. Each competing principle demands the utilization of material on palette in a different way: the first as a conduit of conventional communication and the second as a constructive substance. The artist’s chief conundrum is the accommodation of the ostensible subject, yoked as it is to the substrate, to the demands of an ineffable, illuminated meaning. Here strikes the match against the creative material, the flare of the formative fire, and the creation of a resonant power which for every ambitious endeavor is the measure of worth. James, Henry. The Golden Bowl. Oxford UP, 1983. Levesque, J. H. The Writings of Marcel Duchamp. Michel Sanouillet, Ed. Da Capo P., 1973. Pater, Walter. Studies in the History of the Renaissance. Oxford UP, 2010. The quotation by David. J. Alworth was recorded during a conference titled Commemorating Henry James: Commemoration in Henry James, sponsored by The Henry James Society, held at Brandeis University, Waltham, Mass., June 9-11, 2016.